May 27, 2009 – This year’s Nelson Mandela Annual Lecture, scheduled for July 11, will be delivered by Professor Muhammad Yunus. The founder and managing director of Grameen Bank and 2006 Nobel Peace Prize winner will be focusing on “investment in the marginalised as a way of creating wealth and combating poverty”. Prof Yunus is also the author of Banker to the Poor, a book about how he came to see the relationship between rich and poor in a new way, and his vision for eradicating poverty from the world. To that end, Grameen Bank specialises in microloans of as little as a few dollars to the very poor, to help them start small businesses. As commercial banks seldom lend to the very poor, Grameen provides credit to those, arguably, who need it most. Started in Bangladesh in the 1970s, Grameen now operates in 100 countries, lending $100-million per month. 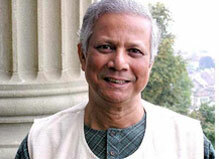 Prof Yunus’ vision is starting to become a reality, with Grameen pulling millions of people out of poverty every year. “This business approach to the alleviation of poverty has allowed millions of individuals to work their way out of poverty with dignity,” the World Bank is quoted as saying on the Muhammad Yunus Foundation website. In addition to the humanitarian aspect of Prof Yunus’ work, Grameen is flourishing at a time when financial markets are in turmoil. On top of his 2006 Nobel Peace Prize, Prof Yunus has received over 70 major international awards for his work and 29 honorary degrees. He sits on the board of advisors of a plethora of national and international companies. Mothomang Diaho, head of the Foundation’s Dialogue Programme, says that there were two levels of reasoning behind inviting Professor Yunus to deliver this year’s Annual Lecture. “We have always looked for people with global presence, thought leaders who have a global influence, and Prof Yunus fits this bill. Diaho says there is a good fit between the speaker and the Foundation’s philosophy, which is why Prof Yunus was asked to deliver this year’s Annual Lecture. Prof Yunus started his studies at a local village school in Bangladesh before enrolling at Lamabazar Primary School when his family moved to Chittagong. He continued his studies in Chittagong, finishing in the top 20 out of nearly 40 000 matric students in the East Pakistan region. He went on to the Chittagong College, where he won several awards for acting, before enrolling in the department of economics at Dhaka University. He completed his BA in 1960 and his MA in 1961. Upon graduation he worked as a research assistant to Professor Nurul Islam and Rehman Sobhan at the Bureau of Economics. After being awarded a Fulbright scholarship, he travelled to the United States to do his PhD in economics at Vanderbilt University. Having completed his doctorate in 1969, he spent three years, from 1969 to 1972, at Middle Tennessee State University as an assistant professor of economics before moving back to Bangladesh to take up a professorship at the Chittagong University. It wasn’t, however, until 1974 that Prof Yunus first became involved in the economics of poverty during a famine in Bangladesh. During that period, he discovered that very small loans often made a disproportionate difference to the very poor. Two years later, he founded Grameen. Professor Muhammad Yunus’ biography is available as a downloadable PDF.